One of my biggest dislikes about cooking butternut squash is peeling it! That is why I decided to make this easier for everyone… I like to roast my squash in the oven first, while the soup is cooking. Then simple scoop the cooked squash into the soup, puree it and you’re done! Peeling and cutting 2 apples is not nearly as labor intensive as peeling and chopping hard butterut squash. Enjoy this hearty soup in under an hour! In a large pot, saute your onions and apples in oil until tender. Add spices and salt. Add broth, cider and water. Bring to a boil, then turn to low and simmer for 30 minutes. Stir in your mashed butternut squash. 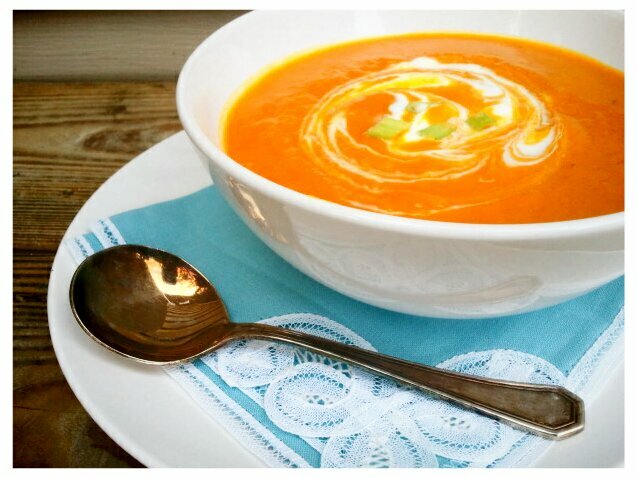 Using a hand immersion blender or food processor – puree your soup. Add additional liquid if needed to adjust the texture of the soup to your liking. If you like a sweeter soup, add more cider. More savory, add broth. Serve warm with a dollop of greek yogurt and freshly chopped chives.